For background on the evolution of rubberized contacts and the development of the process, please refer to the first entry in this series, Rubberized Contacts: What Does That Even Mean. 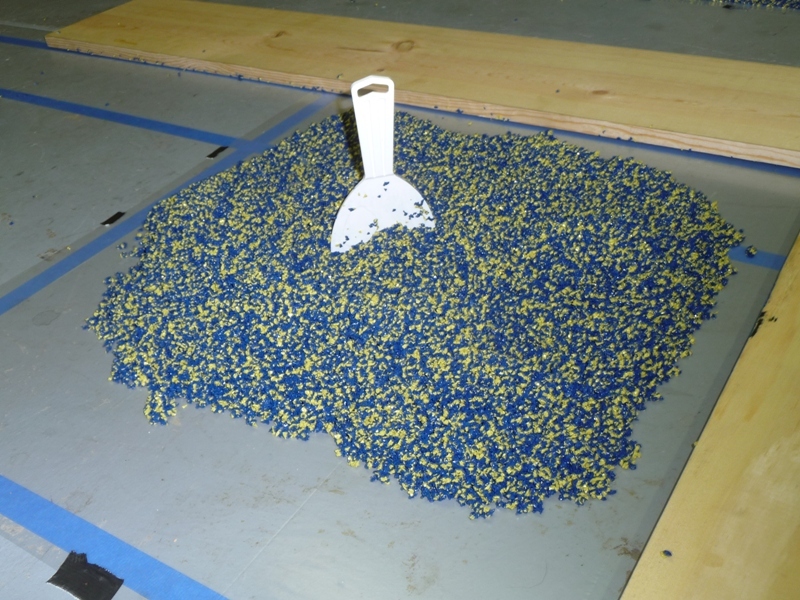 Several weeks ago, the Bay Team and SMART equipment committees decided to dip their toes into rubberized contacts by making the simplest ones – table top/sides and chute pads/rims. I thought that was a reasonable place for me to start too, so I piggy-backed my order. 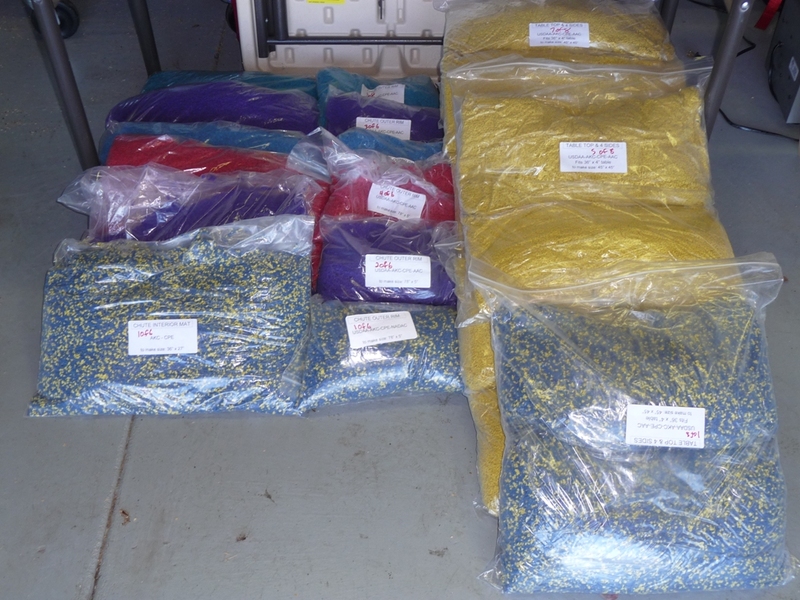 I also offered to host the fabrication effort so the whole order (including a few more piggy-backers) got shipped to my house – kits for 8 tables and 6 chutes. I thought it would be wise for me to make my own set before we start on the club equipment for two reasons: (1) I could learn my lessons on ones that will only be used in my backyard and not in competition, and (2) I could get a feel for the effort involved and better determine how to get the rest of them done. I went through the book and prepared a shopping list of required tools and supplies. I ended up at Lowes, Office Depot, Target and Wal-Mart before I finally got home. Here is the full array of supplemental stuff. 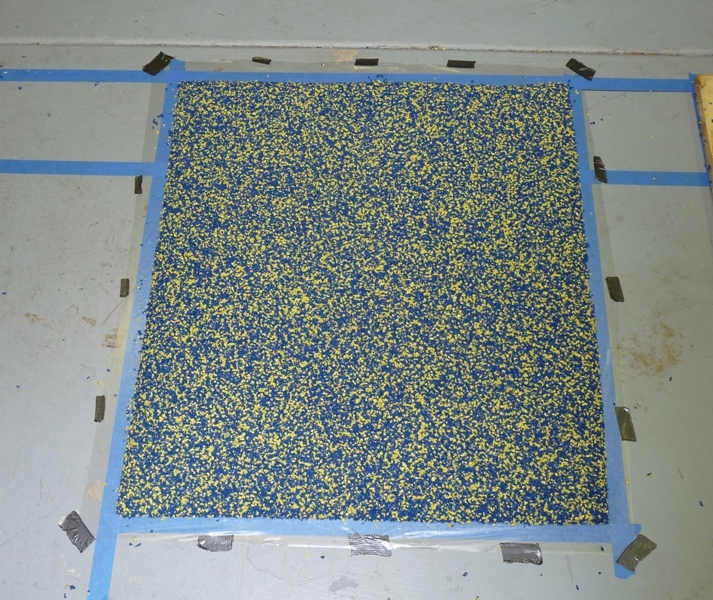 The next task was to lay out the tape pattern on the floor. Since I’m not making a whole set of skins, I didn’t need to use the master plan from the book. Instead, I made up my own scheme based on the specs in the book. I overlapped pieces to minimize the space required. The large box on the left is the table (including sides, which get cut out later), the one on the right is the chute mat, and the long skinny one at the top is the chute rim. 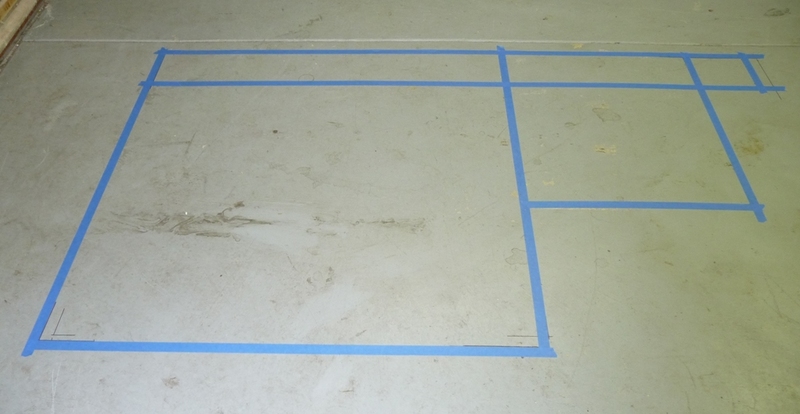 I then prepared the grid for the next step by taping down a sheet of plastic and setting the boards in place. Then it was time to change my clothes, put on the gloves, and start pouring. And finally, here are pictures of the mixed goop ready to spread, and then the final product as it begins its 12-hour cure. I didn’t know what I was doing so I was extra careful. No question I got faster as I gained confidence. I was stopping frequently to take pictures and notes. I rested between each piece because it’s not that easy, and because I was posting the pictures to Facebook. I was distracted by my computer because Rich was on a motorcycle rally and I was following his progress. 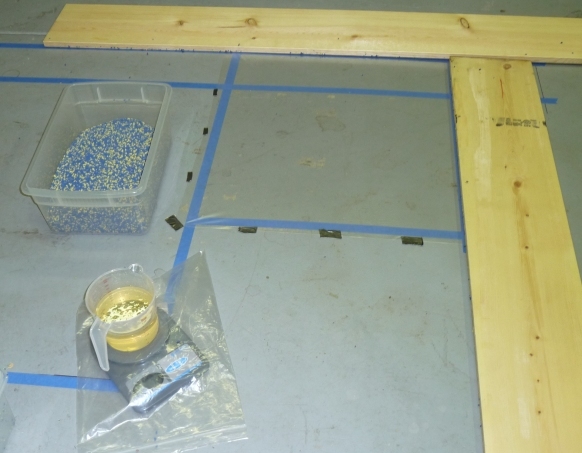 Wrapping up the day at 8:00pm, I had three rubber skins curing in the garage, lots of notes to draft for this blog, and quite a bit of pondering to figure out what kind of efficiencies and economies of scale might be realized by adding more people and space to the process. Because somehow, we have to get 5 more sets ready for gluing by the end of next weekend. Next up, lessons learned during the prep and wet-pour process. This entry was posted on Sunday, June 13th, 2010 at 11:21 am and is filed under Rubberized Contacts. You can follow any responses to this entry through the RSS 2.0 feed. You can leave a response, or trackback from your own site.